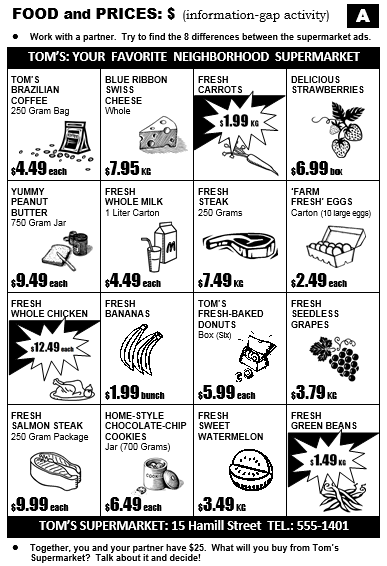 Supermarket advertisement: work with a partner and find the eight differences in the two ('A' & 'B') ads. Choose between 'dollar' and 'British pound' versions; with Answer Key. Have your students seated in pairs with some distance between them to avoid cheating! 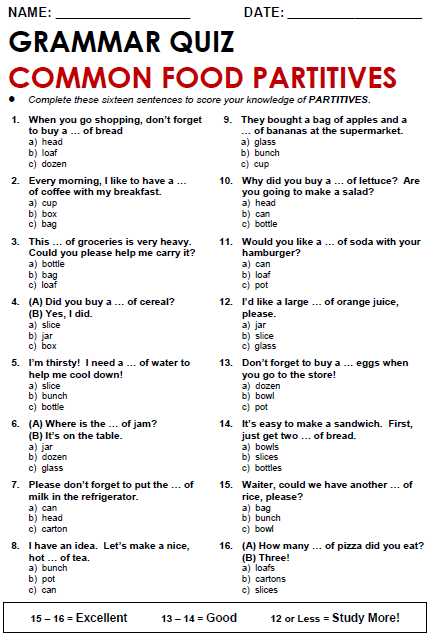 If you choose to, follow-up this activity with the attached writing activity (either in-class or assigned for homework). Before giving playing this game, consider distributing all 15 picture cards and 15 matching phrase cards to your students and having them work together as a class to match them, perhaps using tape or magnets to stick them on the board. Consider also playing the game in groups of four, with two students in two teams. 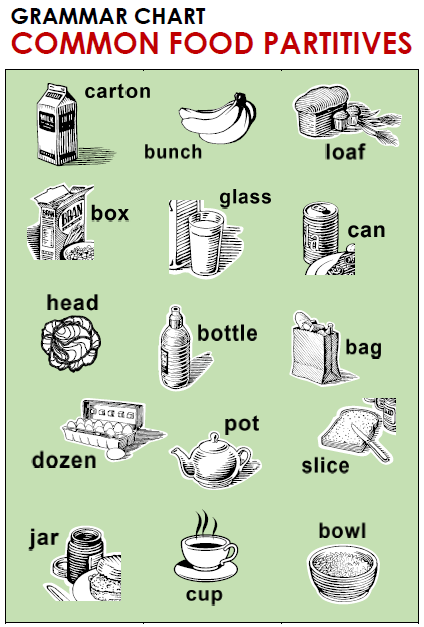 One student in a team can begin by turning over a picture card, and his/her partner can choose a partitive phrase card (this will reduce the number of cards sets that need to be cut up before the class). Play then continues with the other team turning over cards. 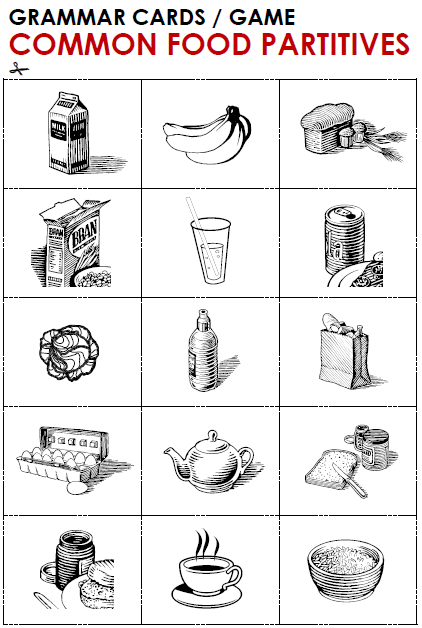 Before giving this worksheet to your students, teach the different food partitives to your learners - have them also first practice with the above card game activity. 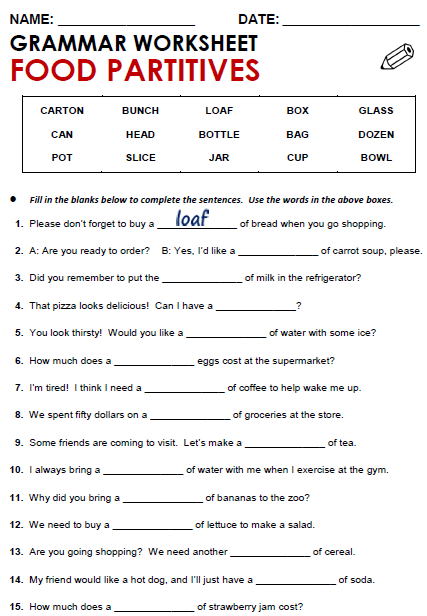 Wrap-up by having students compare answers with classmates, and then choose one or two students to write their answers on the board: (1) loaf; (2) bowl, etc. Correct and discuss any mistakes.